"These potatoes are so creamy, even with reduced-fat cheese and milk. This is a great side dish to a low-fat meat entree. Just add a green salad to complete the meal!" Preheat oven to 400 degrees F (200 degrees C). Lightly butter a 1-quart baking dish. Layer half the potatoes into the bottom of prepared baking dish. Top with onion slices and add remaining potatoes. Season with salt and pepper. Melt butter over medium heat in a saucepan. Mix in flour and salt, stirring constantly with a whisk, for one minute. Stir in milk. Cook until mixture has thickened. Add Cheddar cheese and continue stirring until melted, 30 to 60 seconds. Pour cheese sauce over potatoes and cover dish with aluminum foil. Bake in the preheated oven until cheese sauce is bubbling and potatoes are tender, about 1 1/2 hours. 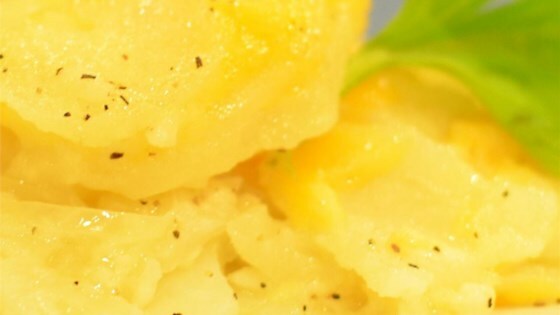 This recipe is a healthier version of Creamy Au Gratin Potatoes. Very tasty. I liked the lowfat alternative. You really didn't miss the high fat ingredients at all. I made this recipe as stated except I used skim milk. The potatoes were still yummy and creamy. Everyone loved the dish and it's a great make-ahead recipe. My husband loved this, didn't notice it was low fat at all. The only thing I changed was to omit the onions because I don't like them, and it turned out great.